A Northern Irish lawyer's debut gets the blood pulsing during a helter-skelter tale that's not your standard courtroom thriller. Steve Cavanagh doesn't waste any time in this exciting first-time effort: within moments of reading the first line, we're witnessing Eddie Flynn get abducted by the Russian mob and have a bomb strapped to his back, with orders to find a way to get it into the New York courthouse and prevent a star witness testifying in a big trial. Flynn hasn't been a lawyer for more than a year, having drowned his sorrows and his life after a harrowing trial. But the Russians make sure he has no chance to turn down their job offer to represent Olek Volchek, the brutal head of New York's Russian mafia: as well as strapping a bomb to Eddie's back, they've kidnapped his daughter. As far as legal thriller openings go, THE DEFENCE is pretty foot-to-the-floor. In a popular sub-genre generally constricted by the guilty or not guilty climax to a tale, Cavanagh has managed to come up with something unique. In film terms, THE DEFENCE would be considered a 'high concept' tale. The fear with such high concepts, however, is that they can overwhelm the rest of the storytelling. While THE DEFENCE can veer towards the over-the-top at times and stretch our suspension of disbelief, for me Cavanagh manages to tip-toe along the tightrope of entertainment and credulousness without falling. There were moments early on where I felt there were potential plot holes ahead, but as things progressed and more was revealed, those potholes were filled, and we hurtle along at high speed on the road he paves. Cavanagh both uses and upturns classic legal thriller tropes, layering in action-thriller elements alongside some finely crafted and exciting courtroom scenes. 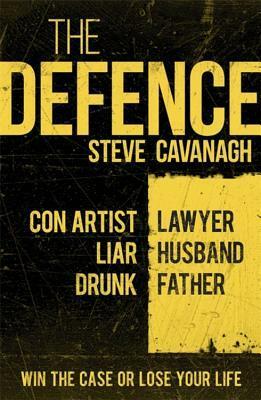 Eddie Flynn is a conman turned defence lawyer turned drunken failure who has to call on all his skills, legal and not, to save his daughter and himself. I was hooked early on to follow Flynn's adventure - Cavanagh creates a nice 'what will happen?' 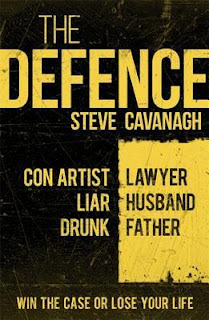 narrative drive - and as THE DEFENCE progresses I enjoyed how we learn a little more about an intriguing lawyer who would be worth following for more than one book - that is, if he can just survive this one. Orbiting around Flynn is a cast of intriguing characters who provide some nice tweaks to the usual suspects in a high profile organised crime trial, from the prosecutor determined to win the case to the array of witnesses, judges, and court staff. Cavanagh injects enough life and personality into many of those characters to ensure they aren't mere ciphers or moving pieces for the thriller plot, and in fact many are very interesting. Given Flynn's background as a conman, he also has some intriguing friends to call on for help. And call he does. Adding to the fun. Like James Bond, Jason Bourne, and other thrillers, THE DEFENCE is the kind of story that it could perhaps be easy to overanalyse and pick apart later, in terms of several 'would that really happen?' kind of moments. But it's a fun, enjoyable read where Cavanagh does a great job helping the reader suspend their disbelief, delivering an exciting tale as we wonder just how the hell Flynn is going to get out of this mess. A clever conceit, enjoyably delivered, with some very nice late twists. I will definitely read more from Steve Cavanagh.